A team of investigators, led by Bradley S. Peterson, MD, director of the Institute for the Developing Mind at Children's Hospital Los Angeles, and Paul Siegel, PhD, associate professor of psychology at Purchase College of the State University of New York, have found that exposure to phobic images without conscious awareness is more effective than longer, conscious exposure for reducing fear. 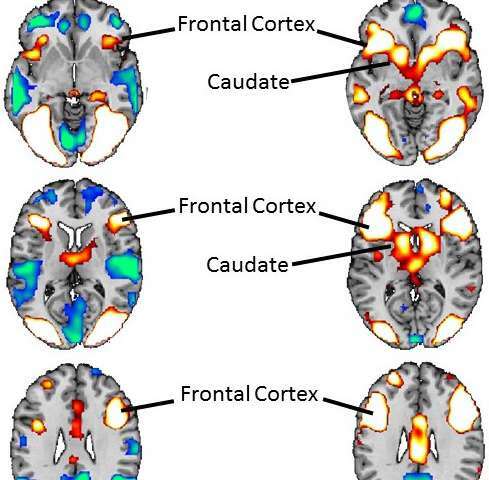 The investigators used fMRI to determine that areas of the brain involved in fear processing were much more strongly activated by unconscious exposure. Results of the study will be published in the journal, Human Brain Mapping, on February 6, 2017. "Although we expected - and observed - activation of the neural regions that process fear," said Peterson, who is also professor of pediatrics and psychiatry at the Keck School of Medicine of the University of Southern California, "we also found activation in regions that regulate the emotional and behavioral responses to fear—reducing the conscious experience of fear." While "phobia" is often defined as an irrational fear, many of the stimuli that produce a phobic response actually have an evolutionary basis that biologically prepares humans to fear them. For this study, the investigators used spiders - a common fear stimulus. They enrolled 21 spider-phobic and 21 non-phobic control participants, all young adult women. Women were selected because previous research has shown that 75 to 80 percent of all people who experience phobias are women. All participants experienced three conditions that included viewing control images not associated with phobias (flowers) and phobia-inducing images (spiders) at two levels of exposure - very brief (without awareness) and longer duration (clearly visible). The very brief exposure was accomplished through a technique known as backward masking, where a target image is shown very briefly and then immediately followed by a non-target image or "mask" that prevents recognition of the target. In participants with phobia, very brief exposure to spider images strongly activated the subcortical regions of the brain involved in immediate fear processing. Yet they did not experience fear consciously, apparently because the very brief exposures also activated brain regions that regulate fear. Clearly visible exposure to the spider images, by contrast, deactivated areas of the brain that regulate fear responses, inducing the conscious experience of fear. "Counter-intuitively, our study showed that the brain is better able to process feared stimuli when they are presented without conscious awareness," said Siegel, who is first author on the study. "Our findings suggest that phobic people may be better prepared to face their fears if at first they are not consciously aware that they've faced them." Peterson added that he saw potential for using this technique to treat children and adolescents with anxiety disorders. Current therapies are based on directly confronting the feared stimulus, which can cause young people to experience significant emotional distress. Explainer: Why are we afraid of spiders?